Reminders is a product aimed to solve all cases of unintentional medication non-adherence which are caused by simple forgetfulness. Taking prescription medication is a routine part of everyday life for nearly 52% of all Indians. Even with the risk of facing dangerous consequences for failing to consume these, sometimes very essential, medications, patients can still forget to take them due to simple forgetfulness and unintended neglect. Reminders, as a feature, was launched in early 2016 onto the Practo app. The launch was just after the addition of the Health records product which provided us with significant amount patient data and helped us understand their need to manage and consumer medications better. Reminders on the Practo app was targeted to be adopted by all the user segments in focus of the app. These were mainly chronic patients, migrant patients, and caretakers. Our interface and design would require little to no technical knowledge and hence could be used by any user on the Practo ecosystem who needs to take medicines. The assumption was simple; millions of customers visit Practo every month. Extend the feature to all these users by leveraging the existing infrastructure to get to market sooner and cheaper. You can read more about the targeted user groups on the Practo app here. I led the design of Reminders for the Practo app since the outset of the project in July 2015. Up until July 2017, I spear-headed the efforts to evolve the service and address customer pain‐points related to the feature. 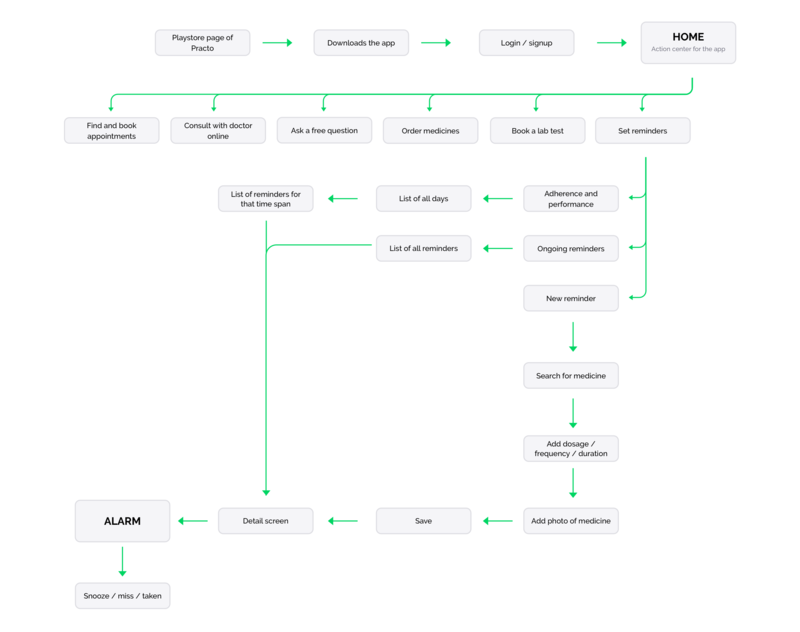 I partnered with three product managers to build this functionality that matched customer behaviors and motivations. Reminders has turned out to the most engaging product on the app. Almost all users perform specific tasks to help them remind take meds. These include placing their medicine in locations that will have a higher chance of attracting their attention. A significant fraction of our users needs someone (usually the family caretaker) to remind them to take medicines. Some even forget the dosages to take as they have misplaced their prescription. Many users mentioned that they often forget to take medicine when it is out of the home. None of the users remember the name of the medicine after a week. They tend to identify the medicine by its color, shape or packaging. I asked our users during the interviews on the tools they currently use. These were digital as well as physical products. I tried to understand the fundamental offerings, positioning, and differentiators of each of these products. Setting up a reminder is not easy at all. Also, not a lot of adjustments in timings and other variations can be done. Next, we evaluated the current mobile app solutions existing on the app stores (Android and iOS). 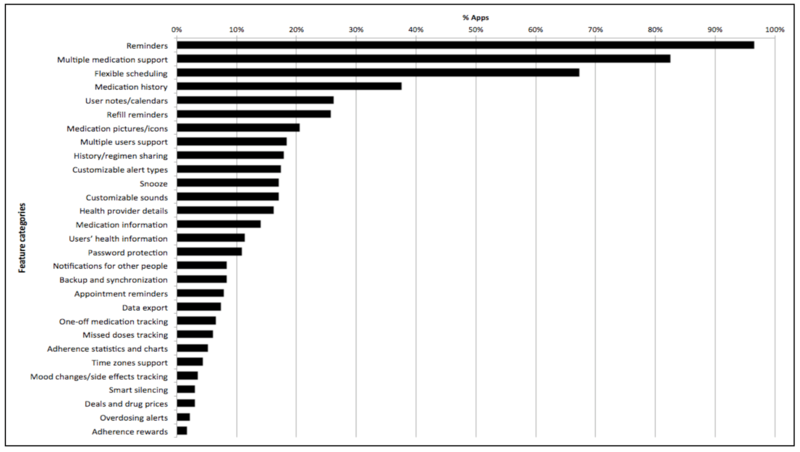 According to a paper written in 2014 by Stawarz, Cox, and Blandford in 2014, there as many as 229 mobile applications which can be considered in some way to be a medicine reminder tool. “I have a medicine I take every 4 days, no app allows me to set this up easily!" "Does nothing more than my phone's alarm. No snooze functionality if I am not around my medicine at the moment." Not usable for irregular pill dosages. Inflexible and not robust. Practo has built an entire ecosystem of products for doctors and other healthcare providers. Doctors can quickly, and seamlessly create and share prescriptions with patients. 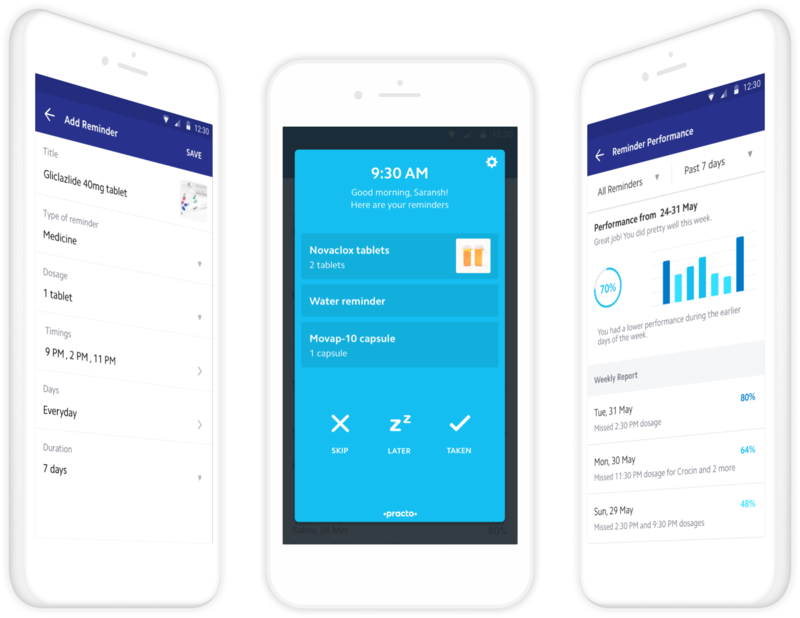 Practo, using the data and medicine information present in the prescriptions shared by doctors, sets up reminders for the patients automatically on their health app. For patients who do not go to doctors who use any of the Practo software, we created a straightforward tool to add reminders. Smart defaults, clean interface, and a flexible structure made the feature very easy to use. We went through many iterations, tested them with users, got a lot of feedback before finally rolling out the final product on to the Practo app. 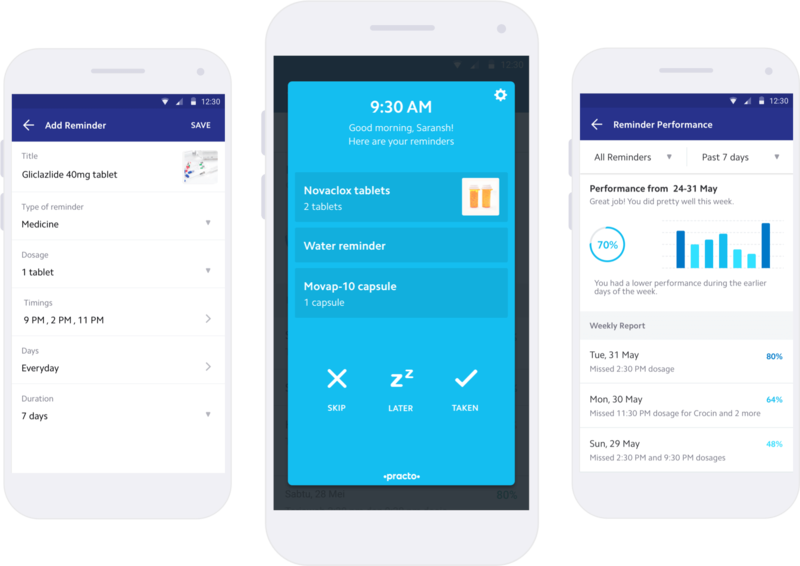 We took advantage of mobile platform's own notification system and created an end-to-end notification framework for users to be reminded on when to take their medicines. We also created an adherence tracking system for users to mark when they missed a dosage. We launched the first version of reminders in January 2016. The product took a lot of iterations and redesigns to reach a minimum desirable experience for our users. We tried to avoid one major mistake we had done earlier. Letting the question "how fast can we ship it?" define the "it," rather than our users. We know the pain-points faced by our users in the current solution provided to them and are working tirelessly to fix them. 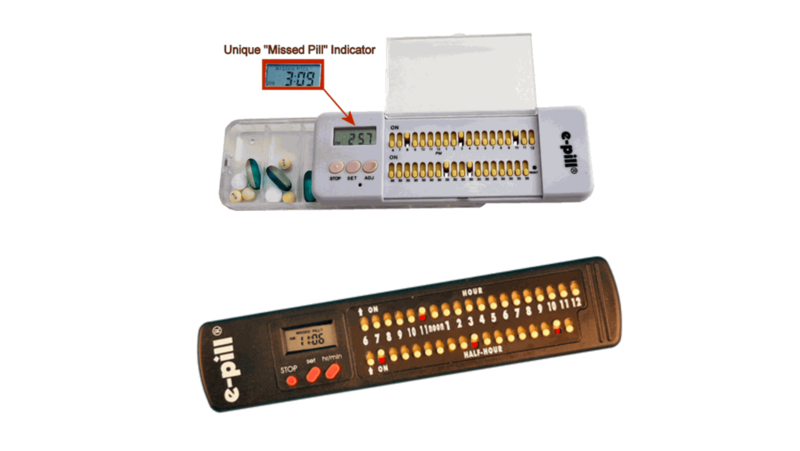 Reminder is a tool which was aimed to help patients solve all cases of unintentional medication non-adherence which are caused by simple forgetfulness. The product has seen some fantastic results since its launch. However, it is still day one here.